Island of Peril is the third level of World 3 in the game Yoshi's Island DS. A Light Blue Yoshi goes through the entire level. It is a very confusing level with several pipes that Yoshi must enter in order to get to different areas of the level. The first part of the level consists of a group of trees with coins and Pirate Guys on them. Some of the coins are Red Coins. After the trees is a small bridge that is guarded by a Cheep-Chomp and has a Winged Cloud. The Cloud, when hit, will allow a green Platform to move up and down. There are also four coins under the prow of a ship, one of which is a Red Coin. When on the ship itself, there are two masts, two Bill Blasters, and a Tap-Tap on top of one mast, guarding a Red Coin. On top of the other mast are four coins, the rightmost of which is a red one. After the ship are two yellow spinning platforms and a pipe on a small island. On either side of the island are five coins above the water. Two of these coins are red. Also, in this area is a high cliff that has one red coin on top of it. The top of the cliff can be landed upon by flutter jumping from the highest mast. Once through the pipe, there will be a Message Block above Yoshi. Left of the block is a Stork Stop and a pipe. To the right is another two pipes and an Egg Block. Four Goonies fly through the air. In the rightmost pipe is another small island with two small rafts on either side of it. 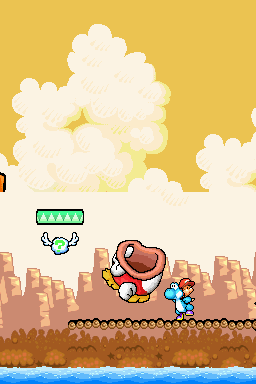 Hitting a Winged Cloud right above Yoshi will create another cloud, and the pattern will continue until a Flower appears. There are also a couple Red Coins in this area. In the pipe just to the left of the Message Block is another island with exactly six Piranha Plants. A flower can be obtained if all of these Piranha Plants are defeated. When the player goes through all the pipes and then comes back out of the pipe they came from, it will be the first area but at nighttime, and after making their way through the ship and a cluster of enemies, the goal ring will be reached. Mujintō wa fushigi ga ippai?! The Isolated Islands are Full of Mysteries?! Muindoneun Shinbiroeun Seom?! The Deserted Island Is a Mysterious Island?! This page was last edited on April 15, 2019, at 02:09.